Remember Abbey Road on the River, that free downtown Cleveland Beatles festival/expo? It was a regular summer event for a few years in the Rock Hall city. And then, like LeBron and other things/people that have a taste of success here, left town for down south (Kentucky, I do believe). Amazing how often that happens. In 2013, a scaled-down version of Abbey Road on the River did come back to Cuyahoga County, but it kind of blindsided me by happening in Independence - at least a Strawberry Fields where one is less likely to get mugged. And there was an admissions charge now, that I was too poor to afford. Still, better than nothing. 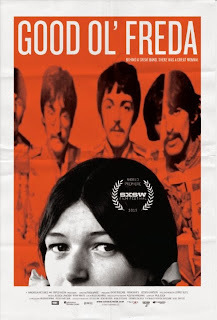 Beatles methadone for me instead was GOOD OL' FREDA, an okay little nonfiction picture that purports to offer a narrative of the Beatles from an insider who, prior to now, had never told all in big-book/movie deal form (unlike, say, every last person who was involved in the Ariel Castro/Seymour Avenue affair). Our heroine is Freda Kelly, now approaching 70. In her youth, she was just an ordinary Liverpool secretary and Beatles fan who regularly patronized the Cavern Club in the early 1960s (back when original drummer Pete Best was the most popular lad with the ladies). 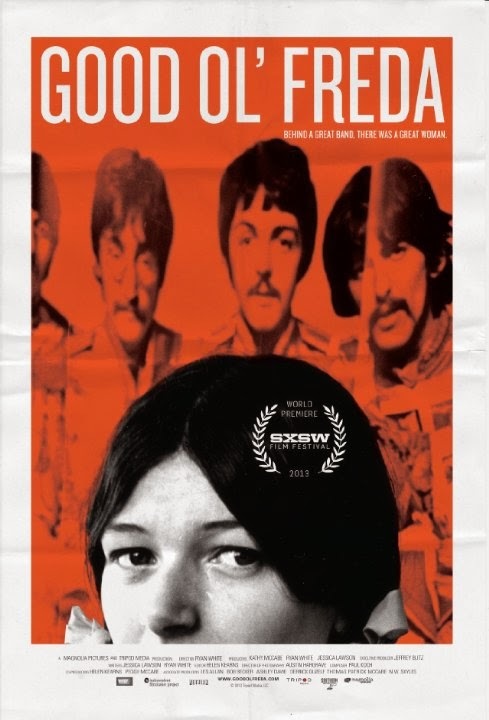 Freda had the luck and reputation as a familiar friendly face and trained office "dogsbody" (a British idiom I do wish had migrated over here, far more so than "selfie") to get hired on by Brian Epstein as the secretary, in charge of the group's fan club, among other responsibilities. Ironically, Freda's widowed dad disliked rock music and showbiz in general and had no fondness for Beatles. But, hailing from their same Liverpudlian culture, Freda knew the musicians and their families well, and for ten years, as the Beatles went from stardom to megastardom, to Maharishis and movie roles, Freda sent out the fan newsletter. Freda answered fan mail. Frieda fielded reporters asking if Paul was dead. Freda was an extra in the bewildering film project that was MAGICAL MYSTERY TOUR. Freda did a loyal job guarding the privacy and reputation of the Fab Four. American filmmaker Ryan White, working on a somewhat evident low budget (only four Beatles tunes were legally cleared by Apple for use in this project, and the director felt lucky to get that much), shot 50 hours of interview footage with Freda, pared down to this highlights tour of one of the wildest rides music history - all from Freda's staid, I'll-put-the-kettle-on POV, of course. And if she's no Lester Bangs, Freda Kelly comes across as an epitome of working-class virtue, decency and duty - the movie even comes up with a fellow Liverpool office girl Freda had to fire, back in the old days, for trying to smuggle out Beatles hair clippings, to show that Miss Kelly was no pushover. That's really as bad as it gets for shock! Horror! Betrayal! revelations, though Freda describes the tragic news of Brian Epstein's drug-overdose death (which she believes was an accident, not suicide). Making the haphazard MAGICAL MYSTERY TOUR was, in part, the group's attempted rebound emotionally from that loss, she says. Freda, incidentally, was unaware after her hiring that Epstein was even homosexual until John Lennon broke the news in typically jocular fashion. The mercurial Lennon also figures in two funny stories, first that Epstein was in a rage when Freda (and road manager Neil Aspinall) accidentally erased precious live-recording tapes of the Beatles on tour because they didn't comprehend operations of a reel-to-reel tape recorder. Lennon defused the moment by laughing it all off. Later, however, at a gig where Freda tarried with the Moody Blues (who had more liquor in their dressing room), a snippier Lennon apparently fired Freda on the spot when she showed up late. This time George, Paul and Ringo came in and laughed off the uncomfortable moment, and Freda was back. Even so, I bet there are those who die a little inside at the thought of those erased tracks. While a fortune in Beatles memorabilia passed through Rita's hands over her tenure, she simply gave most of them away, as promos, gifts and fan appreciations, as per her job description, and she has no painful regrets about that. To this day, the lady works as a Liverpool secretary - and, according to the DVD commentary, carefully hid her amazing history from her workmates so it wouldn't interfere. With its modest scope and unsurprising message (as per Freda, all the celebrity and success in the world can't buy happiness, not exactly a groundbreaking notion), GOOD OL' FREDA is perhaps best viewed as an adjunct to such books as Shout! The Beatles in Their Generation, The Love You Make and other, admittedly less rosy sagas of the band and the renown that swept up both the quartet and the world. There's a statement up front that now that Freda Kelly has opened up, we've heard from the last surviving Beatles insider. I rather doubt it, but future exposes probably won't be so good-hearted.